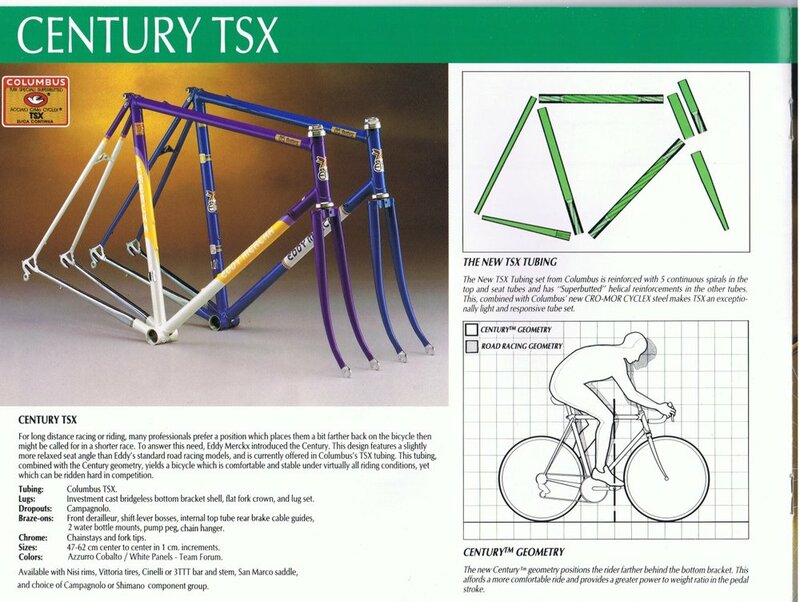 The full Mavic Eddy Merckx Century. A unanimous favorite among us at the shop, this bicycle does not only have one of the most beautiful tube sets, but also some of the most impressive paint and incredibly rare components. The bike has been in our collection for a long time but if you are wondering why it is so clean, it's because it probably has been ridden less than 10 miles in the last 30 years! It actually came to us as a bare frame and box of parts. Realizing how incredible this build would be, we built it to simply to display in our ceiling museum of bicycles. Not for sale but if you want to see this icon in person, it currently resides above our service desk. You can read more about the rare groupset here. 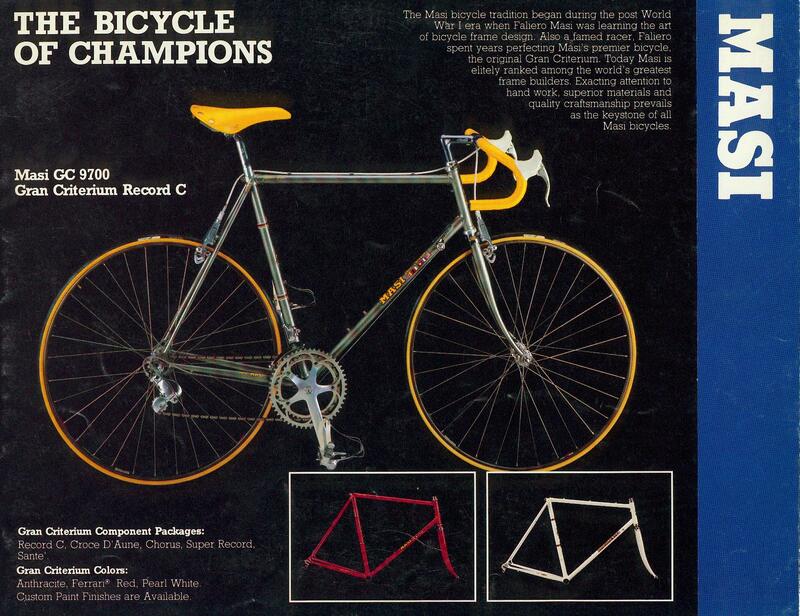 I always find the old bicycle catalogs a fascinating and fun read. This bike came to us from a longtime collector and bike enthusiast. It was bought, ridden a few time then hidden in the back of the owners garage for a few decades. Most likely built in the early 80's or late 70's, this artistic beauty is a sight to behold. The trademark Bianchi Celeste is in full bloom here and we managed to get some photos outside in some perfect twilight. With the gum wall tires, the yellows really come through and brings the whole look together. If you ever want to get a taste of that sweet vintage flavor for yourself, check out their "Eroica" build on their website. If you ever want to see this guy in person, simply go to the tubes section then look up. Behold the majesty of this classic American made bicycle! As indicated by the serial number, this bike was made in America in 1976. A big year for cycling and this blue beauty represents the quintessential bicycle style. Perfectly horizontal top tube, lugged steel and down tube friction shifters. This is the bike that pops in peoples head when you say "old school bicycle". Most likely built by the late Brian Baylis, the tube set is somewhat of a mystery. 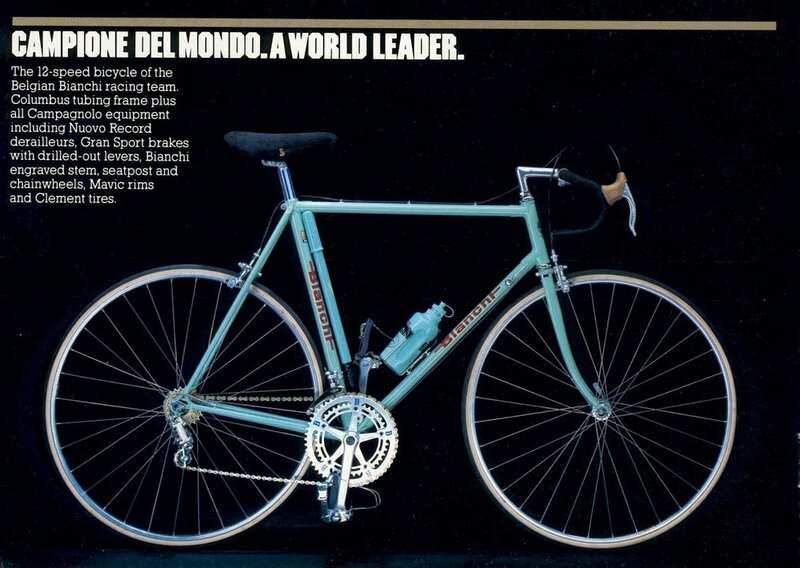 Masi didn't advertise, or even discuss, what steel tubing they used, undoubtly adding to the mystique. We've had this beauty hanging up for 18 years! It's been in Recycled Cycles longer than almost all of us working here! If you really want one for yourself, check out the recreation they offer. Bellissimo! If you have been to Recycled Cycles in the last decade, you might of come upon this beauty of a bicycle. This MAG Scrambler by Schwinn is a serious old school bike overflowing with charm! "Bicycle Motorcross racing is a blasting down a 200-foot straightaway, up and over a jump and into a hard hair pin turn with a berm that's like climbing a wall. You start jammin' and bunny-hop through a series of whoop-de-doo's and then it's the fight for the finish. A swoop inside through the last turn and you've aced out the field." There is no way a kid in the 80's could have resisted that. 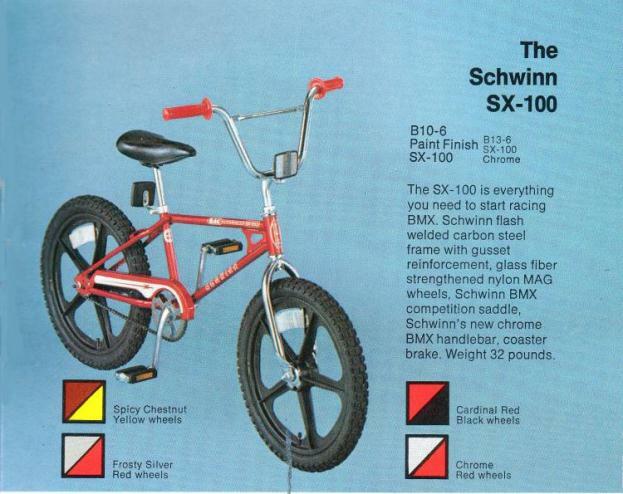 I mean, it makes me want to go out and buy a BMX just so I to could "Start jamming" right now. That tuff neck stem is a rare gem! Totally tricked out with some sick BMX "V" bars, Powerlite grips and a "Tuff Neck" stem this was undoubtedly a well loved bike and it continues to be at Recycled Cycles. Picked up from Jitensha Studio in Berkeley, CA. More of a loving tribute to the mechanical wonder of the bicycle/art gallery, than a traditional bike shop. Established in 1982 by Hiroshi Iimura, Jitensha ("bicycle" in Japanese) offers the fully custom "Shula" where every frame is designed personally for a customer’s specific build. Each frame is built in Japan by an expert bike builder of Hiroshi's choosing. Inspired by traditional French cyclotouring, they are usually built with accompanying custom racks. Jitensha only puts the Shula name on the builds that satisfy his obsessive eye for detail. This rare beauty is impeccably spec'd out with the cleanest set of Shimano Tri-Color I've ever seen. Just look at those clean brake levers! These frames aren't flashy or encumbered with extraneous features. Rather, the well-crafted simplicity of the tubing and lugs are refined to perfection and speak for themselves. This is one of the most pristine Shogun frames we have ever seen, decked out with a gorgeous 2 x 8 friction-shift, Shimano 600 arabesque groupset. Renowned for its intricate design, the group set marks one of the last times Shimano tried something truly flourished, gilded with intricate engravings. A real class act. Uncommon in Shogun frames that typically come through our doors, this one has all its original decals and has almost no scratches or dents. Same with the group, little wear, practically new old stock.